Turks love fish and they love their fish done simply. Occasionally, fırında or baked in the oven will be a choice too. As far as I know, the reasoning for no sauce is that the pure fresh taste of the fish should not be ‘disguised’ unless, as in the güveç, with other fresh vegetables. Whatever, I am happy, more than happy with the fish choices we have here in Istanbul and indeed in Turkey generally. I love the traditional fish markets that reflect the seasonality of the fish swimming down the Bosphorus for example, and the general exuberance surrounding the whole idea of eating fish. Just like your butcher, it is best to cultivate a relationship with your local fishmonger, be he in the supermarket or in one of the outdoor fish markets. It never fails: he will be there for you, advising on the freshest and the most seasonal, so you need not worry about any aspect of buying. He will also pay extra attention to the way he prepares your buy of the day eg if you ask for fillets. We have a new fishmonger, believe it or not: one recommended by my upstairs neighbour for whom I have a great deal of respect. This fishmonger isn’t newly arrived but simply I never bought from him because I didn’t ‘know’ him. Now all is set, we have established our mutual contact and he is proving to be excellent. For those of you who live nearby, he can be found in the little row of shops in Feneryolu on the Asian side. Just mention my name! Last weekend we had some old friends round and I know they all love fish. 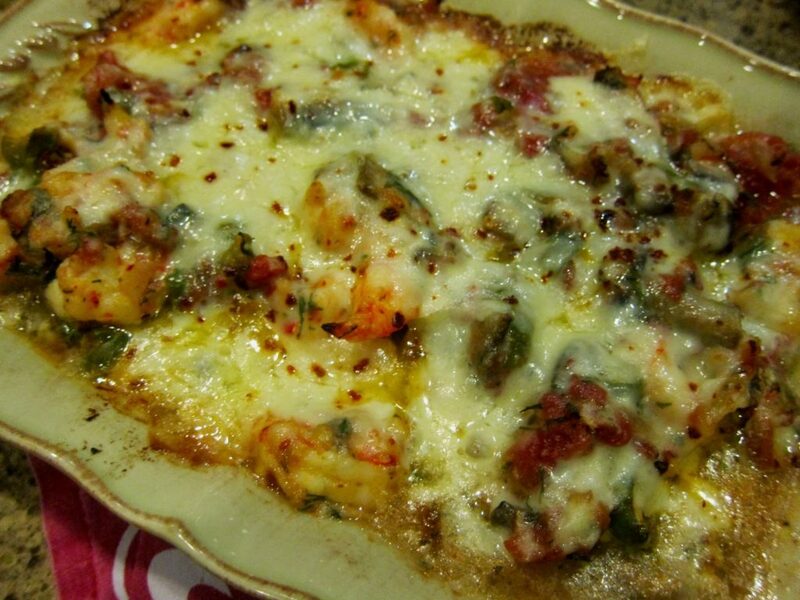 For the main course I made sea bass baked in parchment/kağıtta levrek, and for a hot starter along with a couple of salads, I decided I would offer this shrimp casserole. This proved to be a winning choice and the entire dish was devoured with enthusiasm! 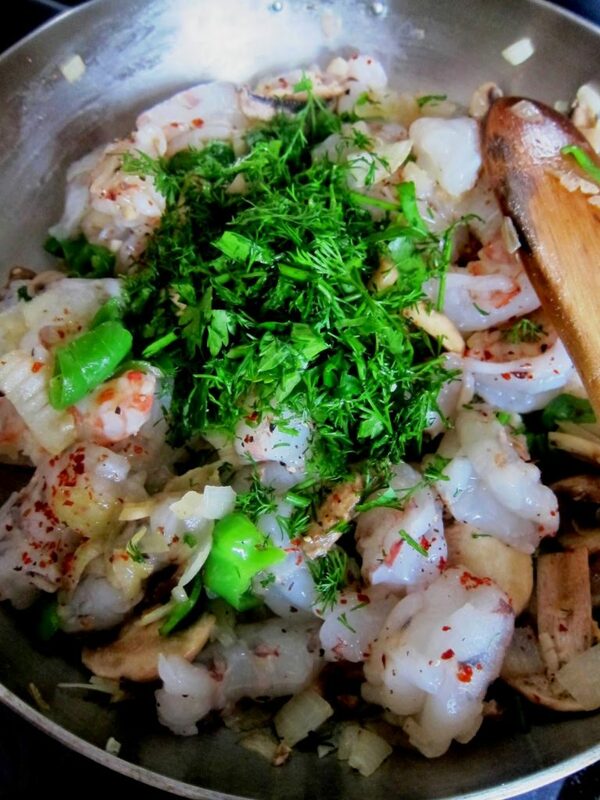 Peel and clean the shrimps or prawns, removing the digestive tract if necessary. Pat dry on kitchen paper. Heat a little olive oil and sauté the chopped onion and sliced garlic until soft. 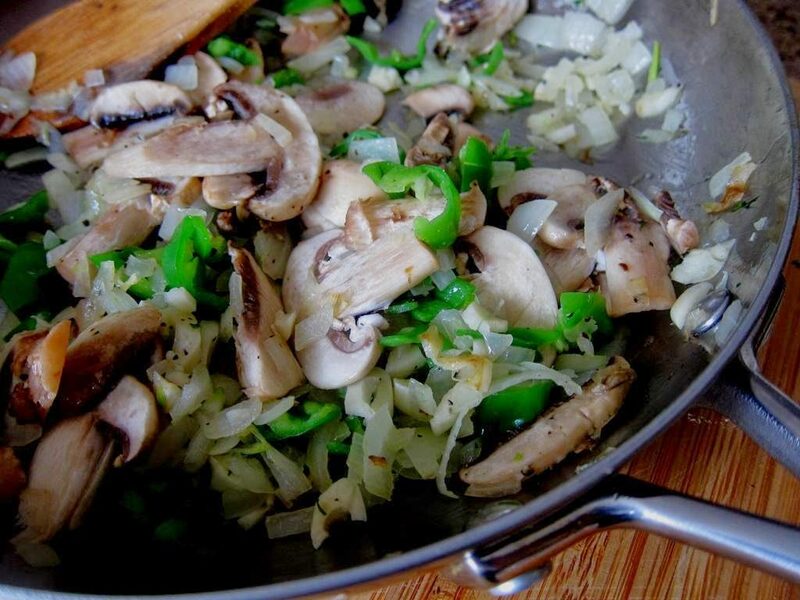 Add the sliced mushrooms, green peppers, bay leaf, and thyme. Add to this the prepared shrimps or prawns, and tomatoes. Season well with the salt and pepper. Sauté for 2 minutes. Add almost all the chopped fresh herbs. 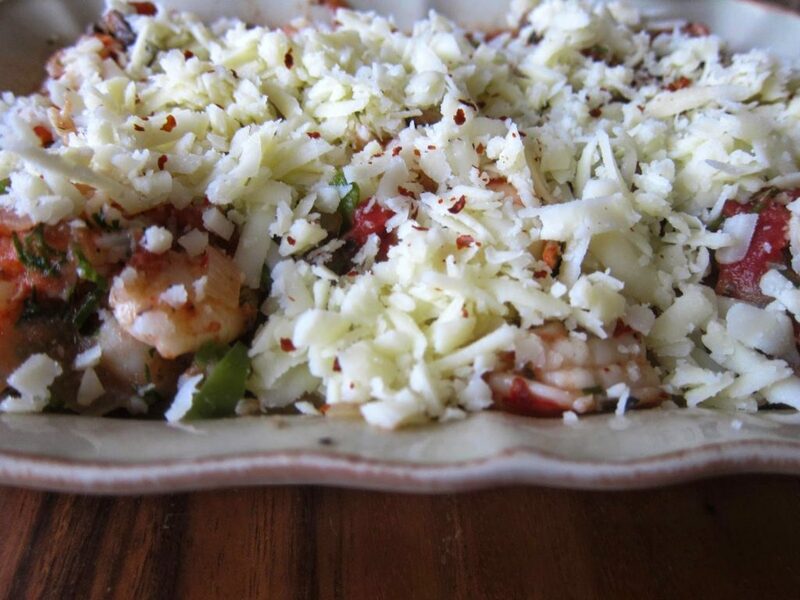 Transfer to an earthenware dish or individual dishes, and sprinkle with the grated cheese. Bake in a hot oven (180C/350F) for 15-20 minutes or until the cheese melts. Serve immediately sprinkled with the remaining chopped green herbs. NB this dish is also great because it can be prepared in advance and then sit in the refrigerator until required. I guarantee your friends will love it! Previous Post: « Monthly Market Update: What’s In and What’s Not in the Turkish Pazars, Plus All About Meyer Lemons!